While hair loss in men is almost always the result a genetic predisposition coupled with age, in women it can happen at any time. According to the American Academy of Dermatology, serious hair loss affects nearly 30 million women in the United States. In a healthy hair system, each time a strand of hair naturally falls out of a follicle, the follicle immediately begins growing a new, replacing strand. With hormonal changes associated with age, follicles can become clogged with a build up of excessive enzymes and hormones that cause it to shrink until it eventually dies or becomes incapable of producing healthy hair growth. Multiply the loss of that replacing strand and hair loss becomes easy to understand. 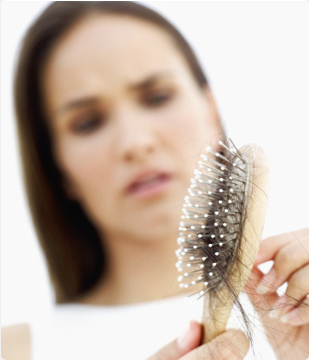 Women experience hair loss through excessive shedding, as well as hair coming out in clumps and patches. Again, unlike men, who tend to experience baldness on the temple or crown of their heads, women see their hair loss less specifically based, but occurring around the whole top of their head. Hair loss often follows childbirth, crash dieting, surgery or a traumatic emotional event. But it can also be a symptom of some greater underlying physical problem, or including not only hormonal changes, but also chronic illnesses such as anemia or thyroid disorder. For this reason, we recommend a consultation with anyone who is experiencing serious hair loss. At Barba Dermatology, our systematic approach to treatment reflects how seriously we take the problem of hair loss. We begin with a consultation and a thorough physical exam of the scalp. We follow up with lab work to look for internal causes, while a biopsy of the scalp is sent to dermatopathologist who specializes in hair loss. Medical treatment is then tailored to the patient’s particular case, such as early female pattern, alopecia areata, and telogen effluvium. Treatments can include injections, vitamins, shampoos, topical medications and if needed, systemic medications for hair loss.